Boston Centerless supplies AccuRod® precision ground bar materials for close tolerance machining applications. With over 30 thru-feed centerless grinders, we have the capacity to provide fast lead times and handle large volume contracts. 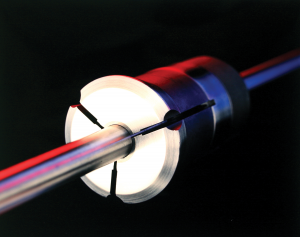 Diameters: .040 to 3.00" .005" to 3.00"
Straightness: to .003" per ft. to .0005" per ft.
We offer a number of Value-Added Services for AccuRod precision bar. With distribution centers located in Woburn, MA; Minneapolis, MN; and Cleveland, OH, we can design a program to manage your inventory and schedule shipments according to your needs.